"Our 3U Professional Module range continues to expand with two new modules. PitchMaster is, as the name states, a master pitch CV source for the calibration and control of 1V/oct devices. It features a precision voltage reference and six high precision adders to generate pitch control voltages for up to three devices. High quality rotary switches give instant octave and semitone steps over 10 octaves. 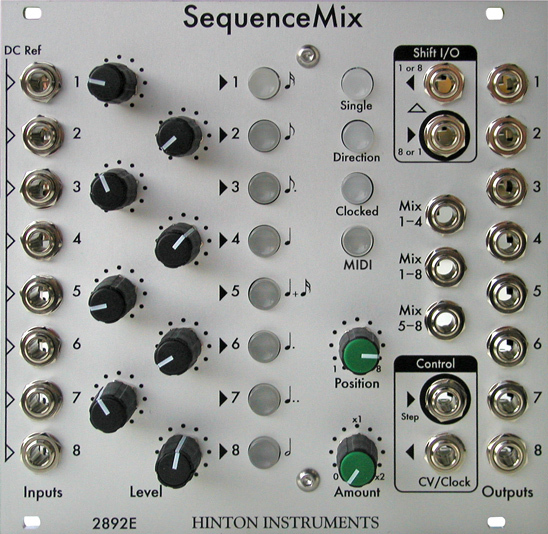 SequenceMix is a shift register controlled group of switches with individual outputs and precision adder outputs. Comprehensive control by analogue CVs, clocks and MIDI make this a highly versatile and expandable module. "Hinton 2000 series modules look similar to Eurorack because they are both based on the same industrial standard, but they are usually deeper and will not fit in shallow Eurorack cases. Both systems will fit in Eurocard frames or custom frames with 200mm or more depth."